NO BRAINER, it had my name all over it! 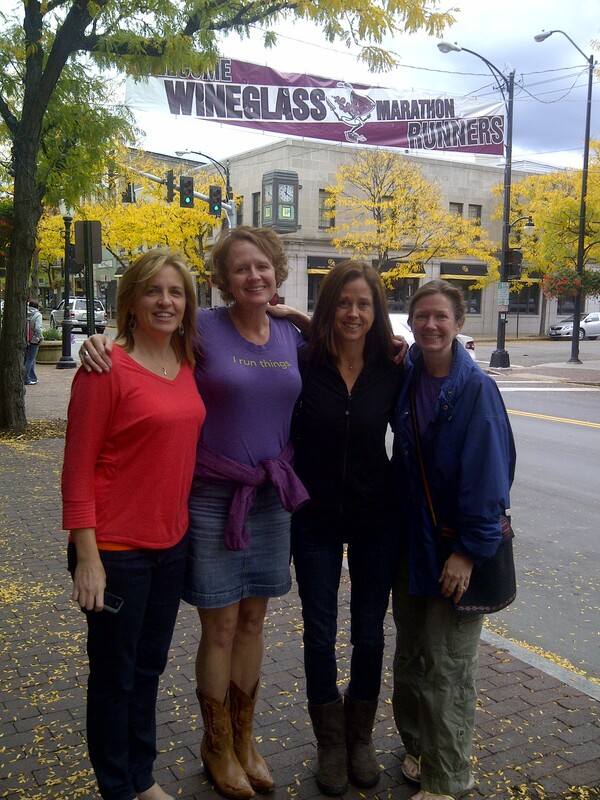 “She” being my BRF (best running friend) Rebecca had her sights on an awesome girls running weekend to re-ignite her running. This would be Rebecca’s “Come Back” / “Post Baby 26.2!” I was so excited to have my BRF back I would go anywhere with her! I was mentally signed up hearing “wine” and “girls weekend” The fact the weekend entailed running a marathon was merely a bonus! Another bonus of this already fabulous girls running weekend was the fact it gave Laura and I the opportunity to check off the state of New York. When we decided to run a marathon/or ultra (ultra was not part of the original deal) in every state we decided there could only be one marathon per state and no repeats. It is the only way we will get them all done….before we die/or die trying 🙂 So we passed on the option to enter the NYC Marathon Lottery. 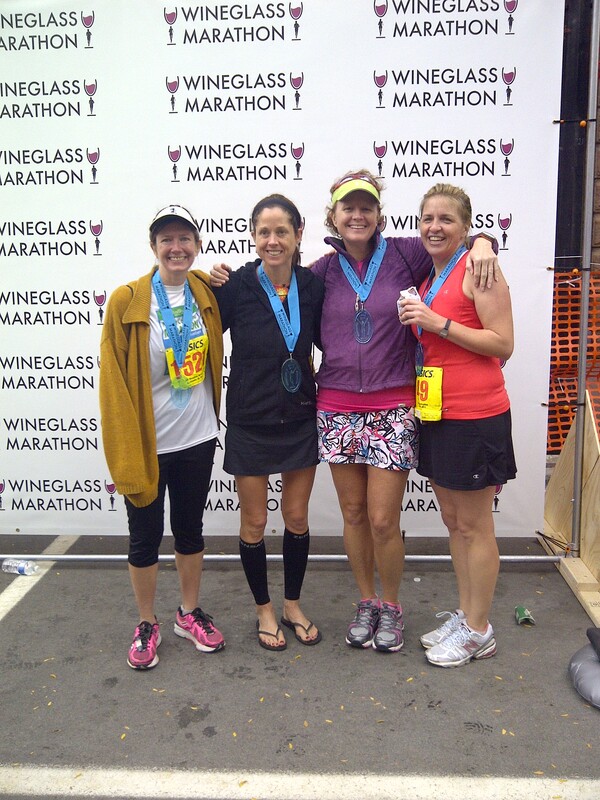 The Wineglass Marathon was our New York Marathon. While the NYC marathon remains on my top 5 must run bucket list it will just have to wait. September finally arrived and the “Southern Invasion” crossed the Mason-Dixon Line and landed in Corning, NY! Whoo Hooo! 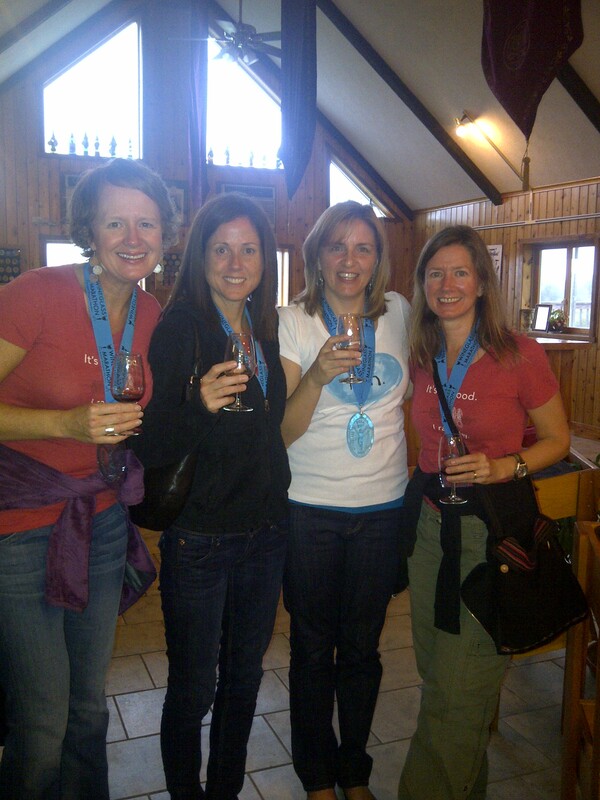 With all ALL my BRF’s in tow it was going to be an amazing weekend……and that is was! Rebecca (yankee transplant to NC), Me, Laura, Becky! We arrived Saturday am and were immediately blow away by the beauty of the area. The air was crisp, the sun was shinning, and the leaves were just starting to turn. It was amazing! We left upper 70’s in NC to 50’s in NY. It was GORGEOUS! The Marathon is a huge event for this area. There were welcome banners in the airport and even a welcoming station for the runners. Wow! These people really rolled out the red carpet and we had not even gotten out of the airport. We knew we were in for an amazing weekend in the finger lakes region of NY. It is a must see and do! We hit the expo to start collecting all the amazing schwag the WGM has become known for. 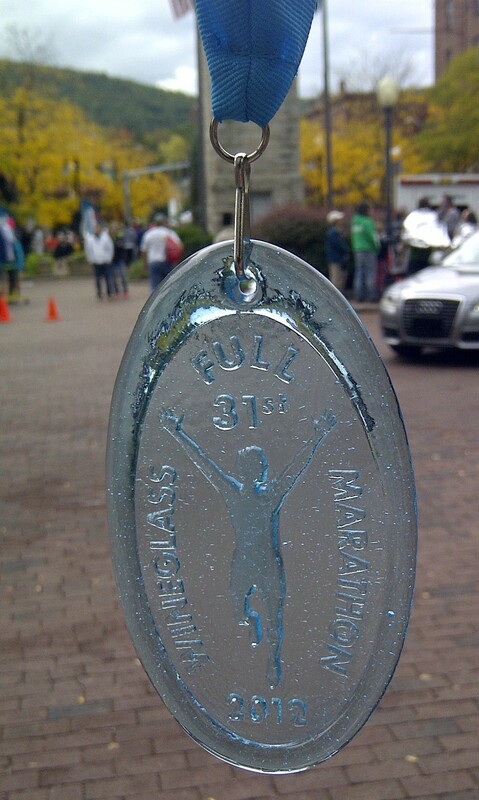 The regional marathon gets high marks on being a fast course, BQ qualifier, and an AWESOME unique glass finishers medal, and a spectacular finish line “spread” of just about anything your heart desires. They must add hospitality to this list. Everyone we met was so excited we were visiting and were just so friendly. I am typically the dead give away anytime I leave the south “You are not from around here, where are you from?” My southern accent, which I will still argue is not that strong 🙂 is always a dead giveaway. So we got to meet lots of people from the area. You know southerns we will talk to anyone. Back to the expo. The WGM organizers and travel and tourism folks were well coordinated. We picked up our bag, shirt, and bib at the YMCA which happened to be beside the Corning Museum of Glass, which as a marathon participant we got reduced admission. Unfortunately, we did not have enough time to visit….we needed more time. 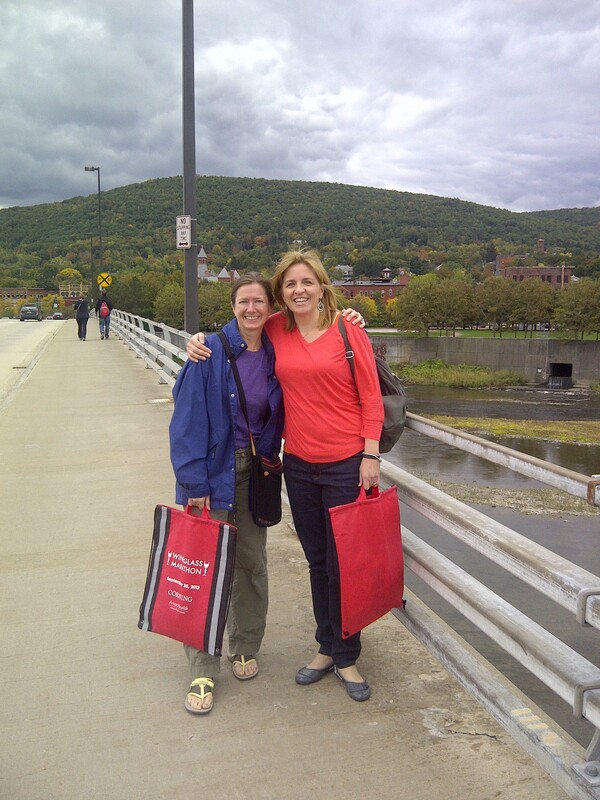 Becky and Rebecca headed to the Heart of Corning for swag! Next, we were instructed to take a short walk across the bridge into the heart of Corning to pick up our WGM wineglass and bottle of champagne made specifically for the weekend. Wow! We also got a sample of Poppletons Harvest Wine Cake the official WGM Cake which was amazing…we bought 2! They ship! We were totally in love with the area and had not been there but a few hours. 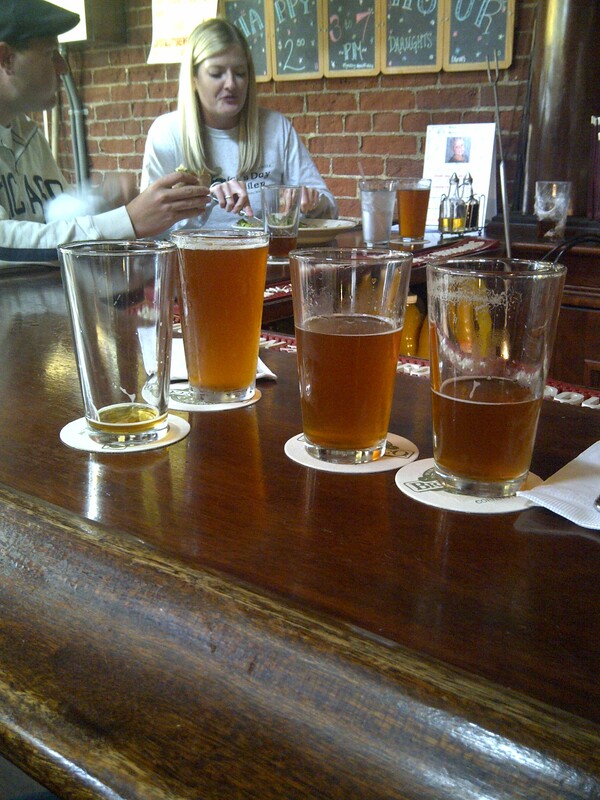 Next we hit Market Street Brewing Company for super yummy appetizers and liquid carb loading! Her 2nd round next to our 1st! Clearly she was seeking carbs! 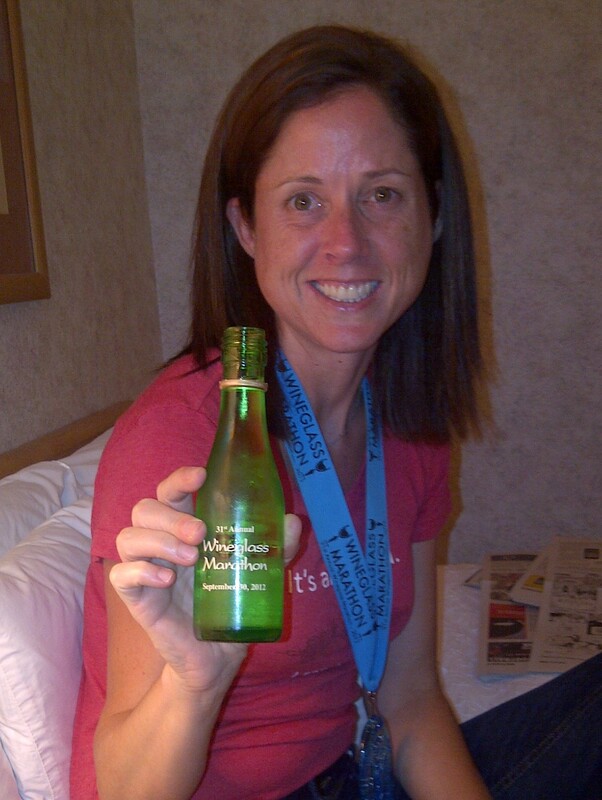 No names will be mentioned but if one of my BRF’s would hydrate while running like she does at the bar her performance just might soar! hehe While we were carb loading, my Corning “admirer” paid us a visit. We met Jimmy earlier on Market Street after he remarked on my cowgirl boots.. Jimmy professed is love for me and wanted me to move to Corning. Me and Jimmy my new friend! Jimmy is know by all the locals as he spends his days cruising Market Street on his mountain bike with his police scanner. If you are in Corning make sure you speak to Jimmy he is so kind and has a HEART of GOLD! Watch out Dan! Market Street was so beautiful and full of unique shops, glass galleries, eateries etc. You can spend an entire day window shopping, eating, and drinking! We hit Sorges, a local Italian eatery for homemade pasta to continue the carb load. It was AMAZING! We got there just in time. As we left there were hoards of people waiting for tables. 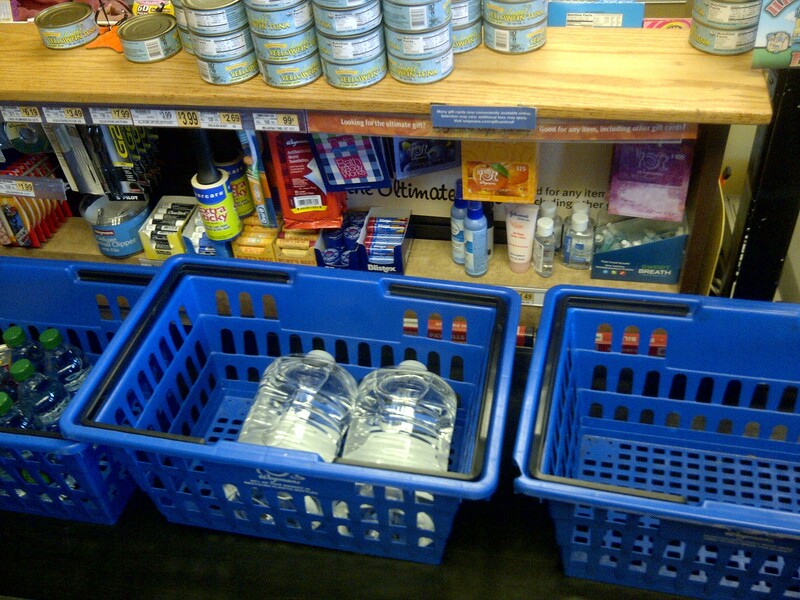 Next we hit Wegmans for food and water. Wegmans was huge and smelled so good! It smelled like thanksgiving! I had fall on my mind. I purchased my typical “big gulps” that everyone makes fun of me for. I consume a lot of water carefully enhanced by my favorite electrolyte tabs NUUN! Which is officially pronounced “Noon” but Rebecca calls them “Nuns” We find them to be rather “heavenly” so the divine reference works for us! We need all the help we can get! Just as Laura and I we were settling in for an attempt at a good nights rest, Rebecca visited to inquire if either of us had extra running skirt or shorts. WHY? Becky, bless her heart, forgot her running shorts. Can we say CRISIS! We were in small town America which is void of Starbucks on every corner, Target, or a sporting goods/running store open past 5:00pm. So off to Walmart they went. Becky returned with some Danskin Capris one size too big that she swore fit her. She thoroughly entertained us for the next half hour modeling all versions of her race day apparel. Underwear, no underwear, underwear over the pants etc…..Just when we thought her apparell could not get any worse she pulled out her “toss sweater” she was going to wear to stay warm pre-race. Dear God! 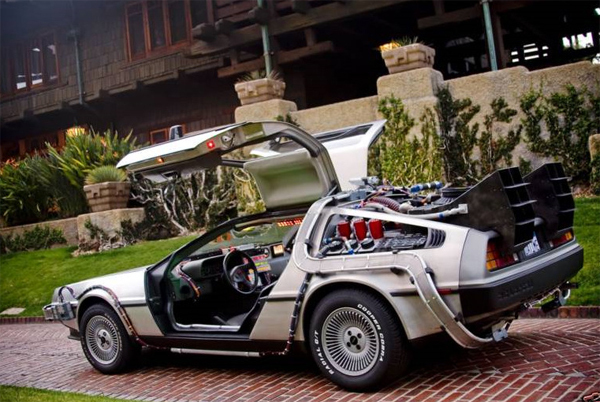 A time machine must have been involved! Becky clearly took a trip to the late 80’s early 90’s to resurrect this golden beauty. We rolled in laughter at the fact she still had this sweater and worse yet she allowed it to take up space in her luggage. 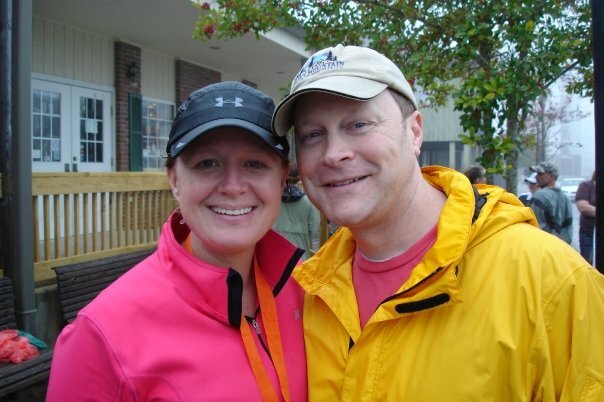 Our laughter just fueled her love affair with the sweater….so Becky being the REBEL that she is wore it pre- race then CHECKED IT! Please someone call Stacy and Clinton we need an intervention! No time for that we had a race to run! 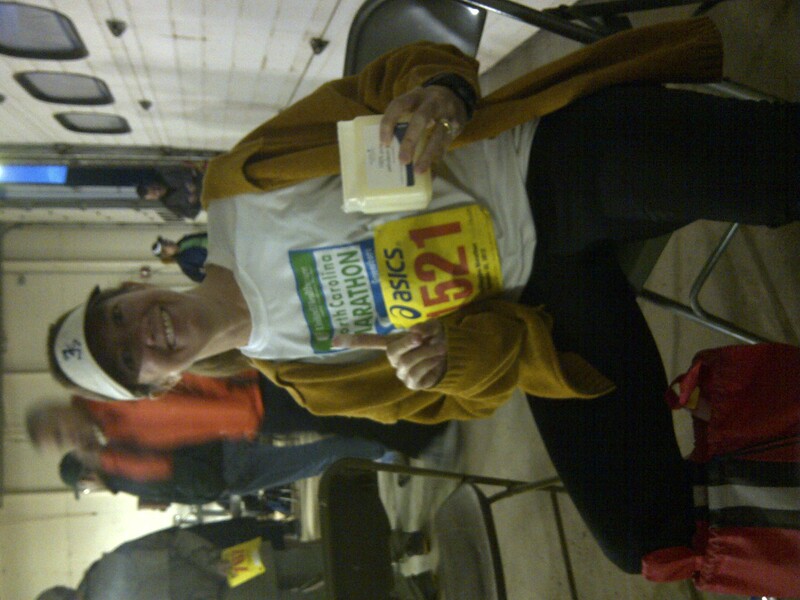 We took the bus to the starting line and were able to hang out in a garage with heaters and chairs. This was luxury (minus the porta potties!) It was cold outside, perfect running weather. We were excited and ready! The course was beautiful! It was flat with two hills, which I would argue don’t even qualify as hills. I would call them slight inclines. The rural route was beautiful, peaceful and generally serine with impressive crowd support for such a small regional marathon. I enjoyed almost every mile…some more than others. I had told myself early on that finishing was my objective. I traveled too far to be bummed out by missing a time goal. I was running for the shear enjoyment of it! Stress free with a little pain here and there. At mile 26 the run down Market Street to the finish was amazing. It was a straight .2 shot to the finish. 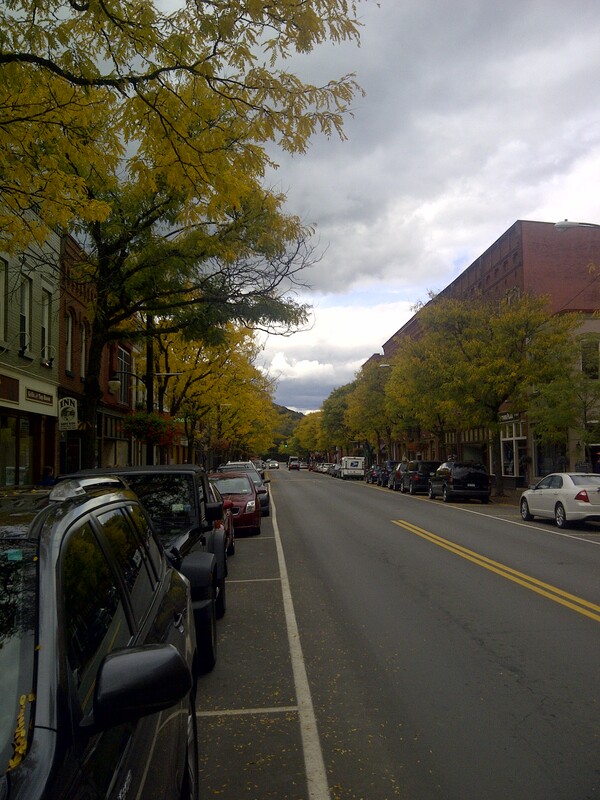 The trees lining the street were beautiful…almost as beautiful as the finish line! Whoo Hoo Marathon #9 done and it was AWESOME! Check out the bling! By far the coolest most unique finishers medal I have ever received. Made locally in Corning. The spread of food and drink was amazing chocolate milk, soda, hot chocolate, fruit, bagels, cookies, hot soup, etc. 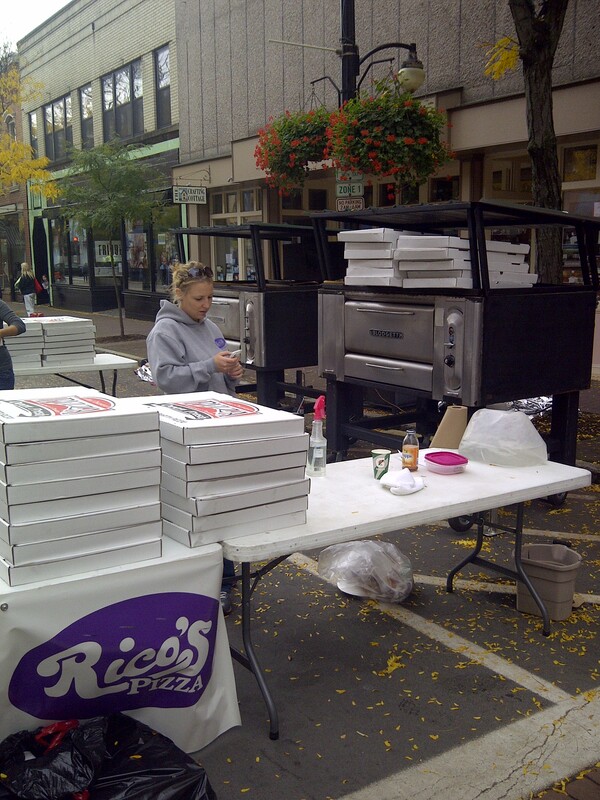 They even had a pizza oven on the street pulling out HOT Pizza! I had to take a picture cause I figured nobody would believe it! Not even the Disney Marathon Weekend can top this spread! We got our grub on then headed back to the hotel to get cleaned up….we had wineries to visit and the clock was ticking! Beckys “golden beauty” is OLDER than the young ladies who took our picture. We cleaned up fast and headed to some local winerys. 1st stop Castel Grisch, Watkins Glen, NY. We were looking super sassy in our Its all Good We Ran Today Tees from AnotherMotherRunner.com ! 2nd stop was Lakewood Vineyards. Tammy took awesome care of us! 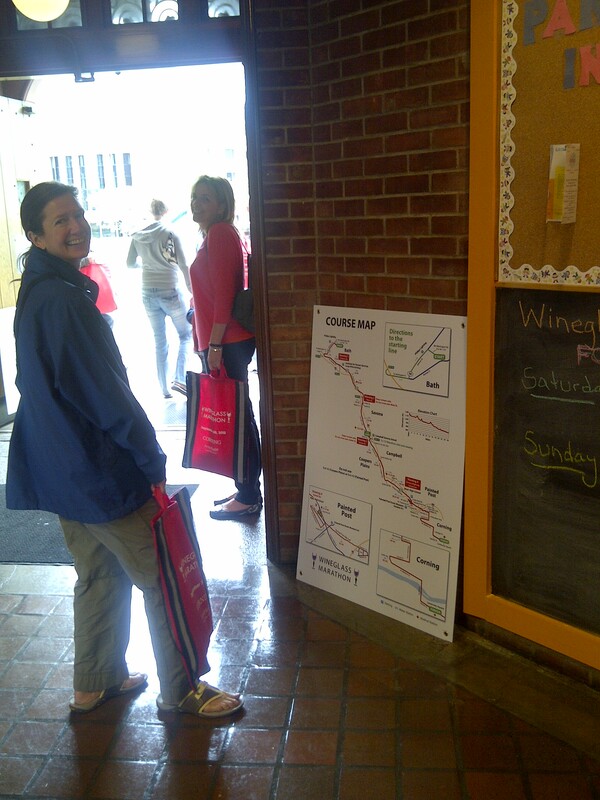 We tasted some fabulous wine (purchases were made) and ate some chesse curds (1st for me). Tammy sent us across the lake to local eatery The Stonecat Cafe. Our meal, all supplied locally, was amazing! If you are in the area its a don’t miss! We headed back to our hotel where we ate our Harvest Wine Cake and toasted to a job well done! 1 Boston Qualifier, 1 recent Personal Best, 1 Post Baby Marathon, and 1 running for the sheer joy of it! We wrapped up our weekend with quiche and coffee at Poppletons Pastries (YUMMY). 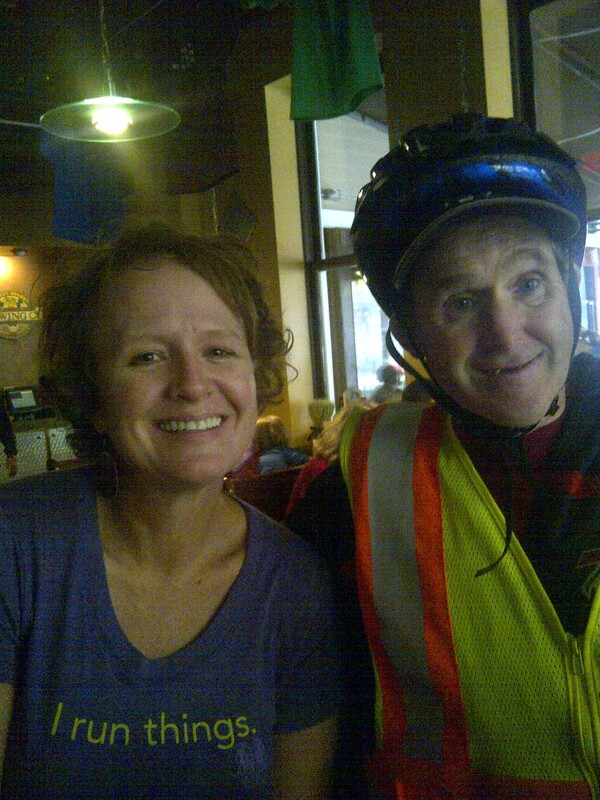 Jimmy spotted as he rode by on his bike and and came in to say hello! 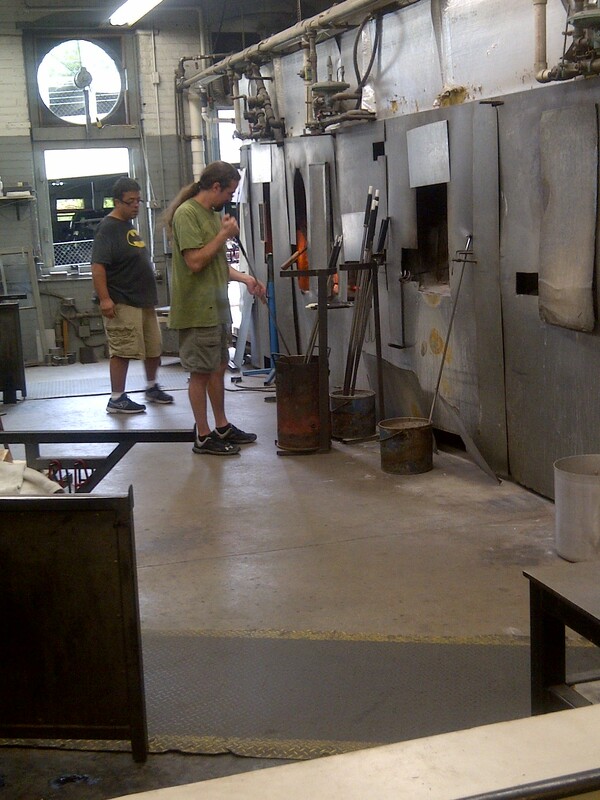 We had some time to kill before our flight so we headed down the street to Vitix Hot Glass Studio. They were busy working on new pieces. I finally, got my glass pumpkin! 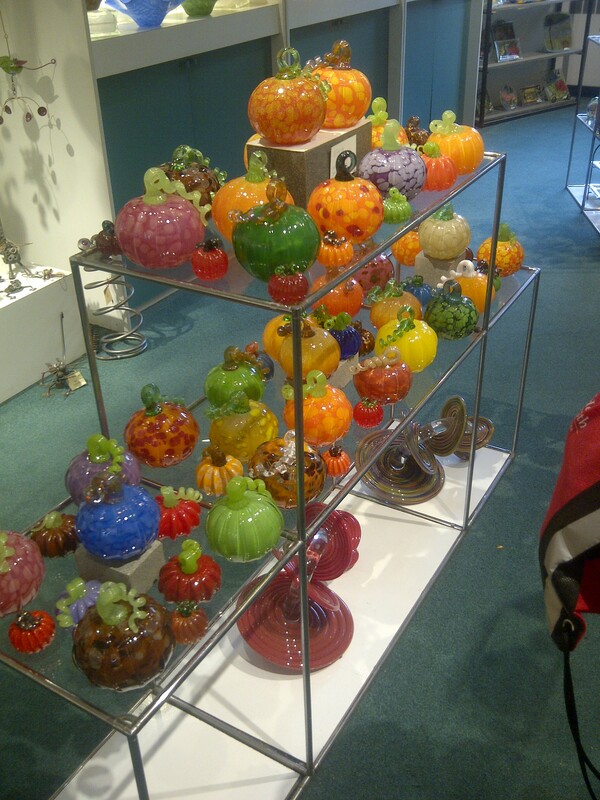 Everywhere we went in Corning were these beautiful glass pumpkins. I had tons of fragile stuff in my suit case already (medal, wine glass) what was another breakable item. Unfortunately our weekend had to come to and end. We did not want to leave. There was so much to do and see but not enough time. Our families and job were waiting for us back in NC! 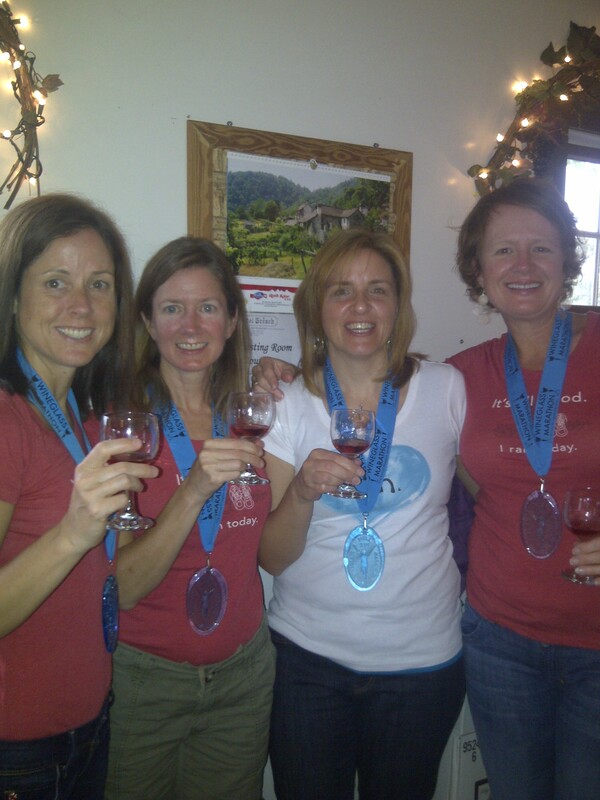 The Wineglass Marathon is a topnotch event! Add it to your running bucket list….I promise it will not disappoint!